William A. Quarles (1825-93), Brigadier General, CSA. Participated at Ft. Donelson, Port Hudson, Atlanta Campaign, Franklin (WIA & POW). Clip Autograph Endorsement Signed (AES) as Comdg. 3rd Brigade (1864). 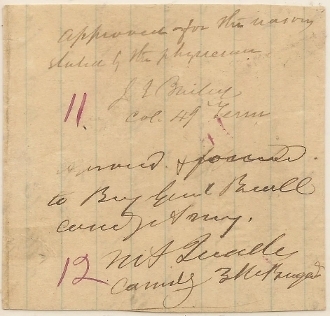 Additional AES of Colonel James E. Bailey, 49th Tennessee Infantry.